« You got a Book in my Party. You got a Party in my Book. Two great things that go great together…. I had the pleasure of being a surprise guest reader for a preschool class this past week. I thought this would be a great opportunity to test a party favor as well. 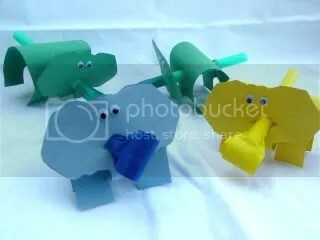 I saw this Elephant party blower craft on the Family Fun website a while ago and have been itching to try it. Now, I did make a few adjustments. I didn’t use craft foam. I’m sure it is sturdier, but I was making 20 of these cuties and cutting craft foam is a bit more involved. Instead, I used construction paper. And with the help of my printer/fax/copier combo, I was able to make quick work of this. You can fit two templates on a sheet of 8 1/2 x 11 sheet of paper, so that speeds up the process as well. The most time-consuming bit is cutting them out. But, it is the perfect activity to half-watch T.V. I finished off with self-stick google eyes and Dollar Store party blowers. Three episodes of Paranormal State later — I was done. Of note, I used noiseless party blowers. They are cheaper at the Dollar Store and I have a thing about giving noisemakers to the little ones. To me, that is like giving matches to a pyromaniac. I once went to a Birthday Party where the pinata was filled with candy and an assortment of whistles. That would be the equivalent of gasoline and matches. The staff and I were so enamored by these pack of pachyderms. We were inspired to try something on our own. 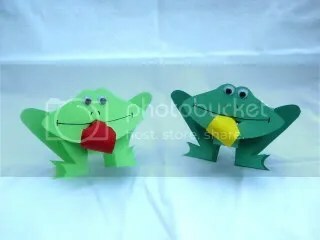 We thought frogs would work very well with the party blowers. So, here is what we came up with. There is an opportunity for kids to personalize these and take some ownership. You could give them the paper cut out and let them color it or add sticker dots for spots as well as the eyes. You will have to help thread the party blower through. I know my staff loves to add their own personal touch to things. The perfect book pairing for our blowers is The Wide Mouth Frog by Keith Faulkner. It is a pop-up book that starts with a wide mouth frog that eats flies. It meets other animals who tell it what they eat, ending with a alligator that says it eats wide mouth frogs. The frog makes a big wet exit — SPLASH! This book is a sure thing. The staff and I believe a snake would be another ideal party blower pairing, but we haven’t worked out the logistics. When we do, you all will be the first to know. Have some great book suggestions, let’s check them out! O…M…G…How entirely cute are those? I think I might have to find a reason to make those.I saw your question about my slow cooker contest. Honestly, anything that is dinner worthy and quick and easy is my only requirement! Casserole is cool, but it doesn't need to be. I hope you enter! !